DPMO is NOT the same as PPM since it is possible that each unit (part) being appraised may be found to have multiple defects of the same type or may have multiple types of defects. A part is defective if it has one or more defects. The number of defectives can never exceed the number of defects. 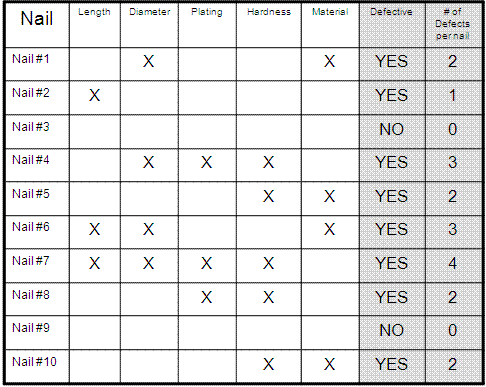 IF each part only has one characteristic that can be a defect, then DPMO and PPM will be the same. 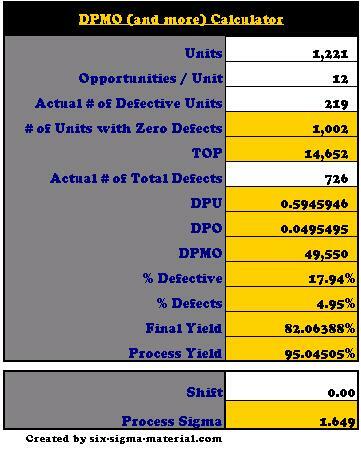 DPMO will always exceed or equal PPM for a given yield or sigma level of performance. Nail #1 it has two types of defects. Therefore it is ONE defective nail that contains TWO defects. There are a couple commonly used Microsoft Excel functions that converts Defects per Million Opportunities (DPMO) to a process sigma (z-score) and vice versa. A Six Sigma quality process refers to the process short-term performance or how it is performing currently when there are 3.4 DPMO. Over the long term, this six sigma process is estimated to shift -1.5 sigma (lower) and will perform at a 4.5 sigma level, which produces 1,350 DPMO. Enter your values in the white cells and everything else is calculated. Notes are in the actual template that offer more guidance and information on each row.